Vespertilio and Deadgreed take the show by storm talking about what they have been up to this season! Vesper starts off explaining how he started the season and what he has been working on. They share some laughs before, during, and after Deadgreed starts sharing how his week in gaming has been. No emails, twitter, or facebook messages but their are blue notes this week! Talk of a new Diablo 2 mod and news on a new Blizzard employee that joins up to work on the possible Diablo 4 (information brought to you by Rhykker). * Diablo 2 mod and new employee working on a Diablo project! Episode 194 – Season 16, I Have The Power! 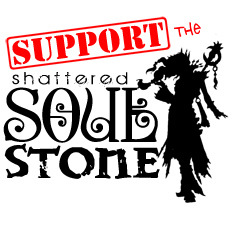 In this new episode of the Shattered Soulstone, Deadgreed and Vespertilio bring in a good friend and long time listener Magnum (AKA Doug)! After getting to know Doug a bit and learning how he was introduced to the Diablo franchise they all share what they have done this week in gaming. Doug then explains his Greater Rift 100 challenge and how he did in it! He also includes all of the details as to what armor sets he used, time frames, how much farming he did, and even augments. Do any of you feel up to the challenge? * Deadgreed and Vespertilio interview Doug for the first time on the show! * Doug explains his Greater Rift 100 Challenge and how he did! Episode 193 – The End Has Come! Part 15! Season 15 has now come to an end! Two weeks until the new season, what will you do on your time off? In this episode Deadgreed brings on another special guest, Shazam! They both talk about how their entire season 15 went, their struggles and what they managed to achieve. In this episode Greed is not alone! He brings in a special guest, Lamneth! This episode starts off with an interview with Lamneth about how he got started with Diablo 3 and all of the games before. After the interview they go into their weeks in gaming and sum up their season 15 experience. Have you ever thought of what buffs would be possible for future seasons? Some ideas are shared here in this episode! * What buffs would you like to see in future seasons? Deadgreed and Vespertilio take this new episode by storm and quickly talk about… well.. not Diablo at first. They talk a little about what they have been up to out of the game then follow it up with an in game tour through how their season went up until this point and even go into what they have planned for next season. New updates for season 16 are discussed and the wait to see who won the raffle for the 2018 Blizzcon Goody bag is finally revealed! * The raffle for the 2018 Blizzcon Goody Bag has ended and the winner has been announced! Deadgreed goes solo and shares his week in gaming. Diablo season 15 ends soon! Rush to finish up your season 15 goals and get ready for season 16. Tune in to find out the dates! Greed talks about themed seasons up until this point and his plans for season 16. * One week left for the 2018 Blizzcon Goodie Bag! Get your email in to join the raffle!